This quick weeknight dinner is an easy, healthy way to feed the whole family. 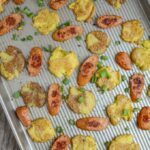 Serve with your favorite steamed vegetables or a simple salad and let the kids help smash the potatoes! Stab each potato with a knife a couple of times. Place them all in a microwave-safe bowl, toss in oil and microwave 3-4 minutes until soft. Place potatoes on baking sheet and smash flat with the bottom of a small glass. Remove from oven. Flip potatoes over and top with grated parmesan cheese and salt and pepper. Slice chicken sausage (I use a diagonal angle to get longer slices) and place the slices on the baking sheet. Garnish with green onion and serve with vegetables. Use your favorite brand of fully-cooked chicken sausage. Feel free to skip the parmesan cheese and season your potatoes with different spices if you desire.